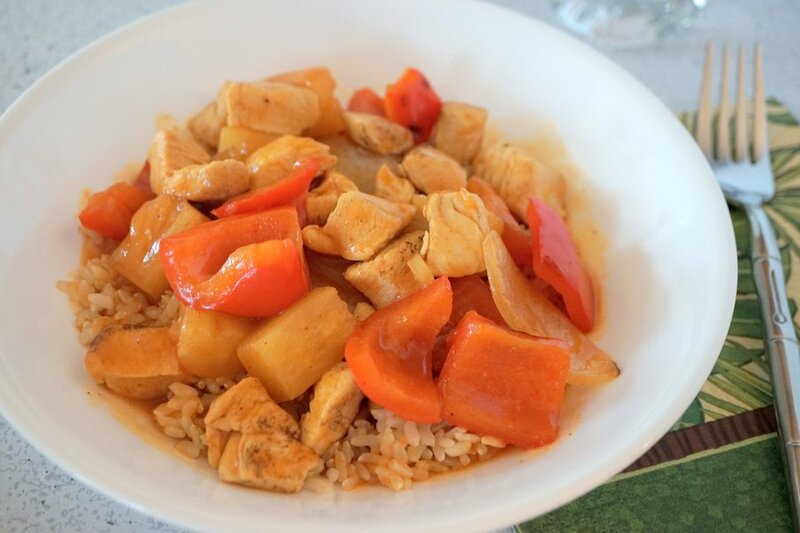 This healthy, quick and easy version of Sweet & Sour Chicken is a dinner favorite in our home! So versatile… you’ll want to give it a place in your weekly or monthly meal rotation too! 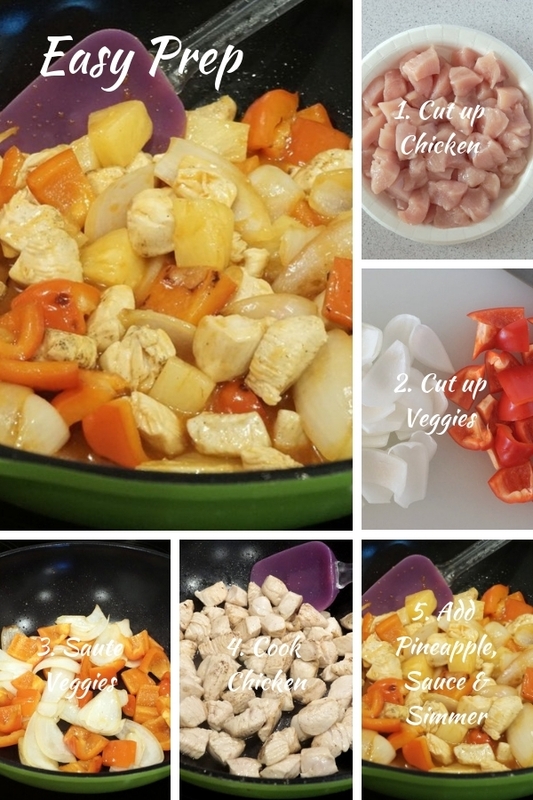 Since Stir Fry’s are so versatile and easy they’ve earned a spot in my family’s list of “Dinner Favorites”. (Click here to see my entire list of 10 Dinner Favorites!) I choose one meal each week from this list when meal planning… which means we’re enjoying a Stir Fry frequently. 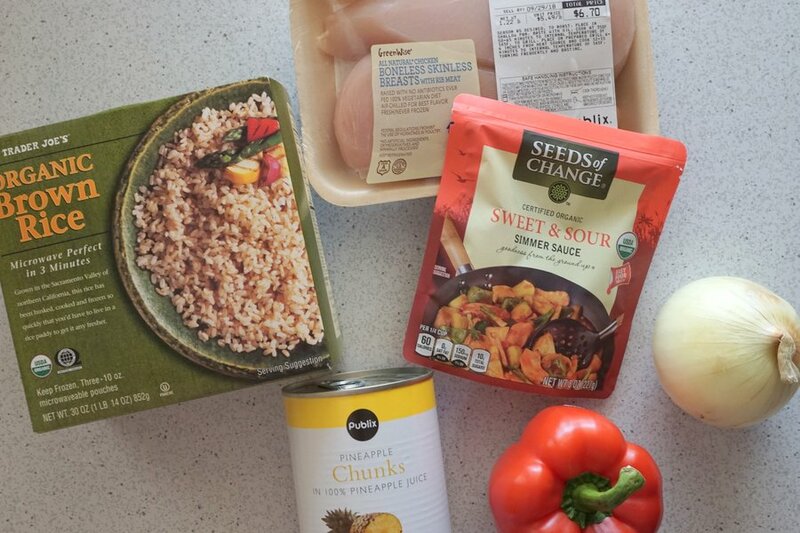 I highly recommend the Seeds of Change Sweet & Sour Simmer Sauce. I’ve looked at several brands, reading labels and comparing, and Seeds of Change comes out on top for me. This sauce provides just the right amount of sweetness while staying very low in sodium (only 150 mg). Plus the ingredient list is short with pronounceable items such as water, cane sugar, rice vinegar, pineapple, onions, tomato paste, soy sauce, etc. There are no artificial colors, flavors or preservatives and no partially hydrogenated oils; all things I look out for in a product. I also love that it comes in a “one-time use” pouch, so I don’t have a bottle of sauce hanging around in my fridge! My local Publix doesn’t sell it, but Target does, so I stock up whenever I stop in. Use pork, shrimp, or tofu instead of chicken. Use jasmine rice or cauliflower rice instead of brown rice. Use any combination of vegetables, fresh or frozen, that you like. 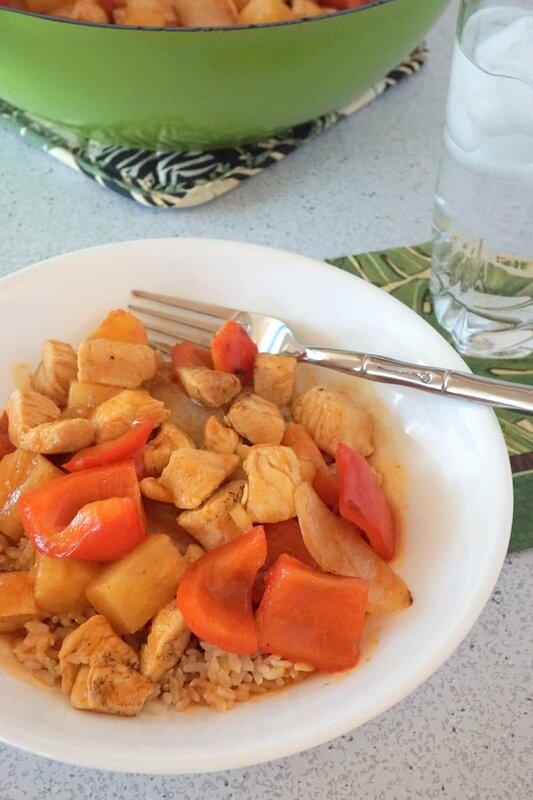 Use any brand of Sweet & Sour sauce, or any other type of sauce that sounds good to you. 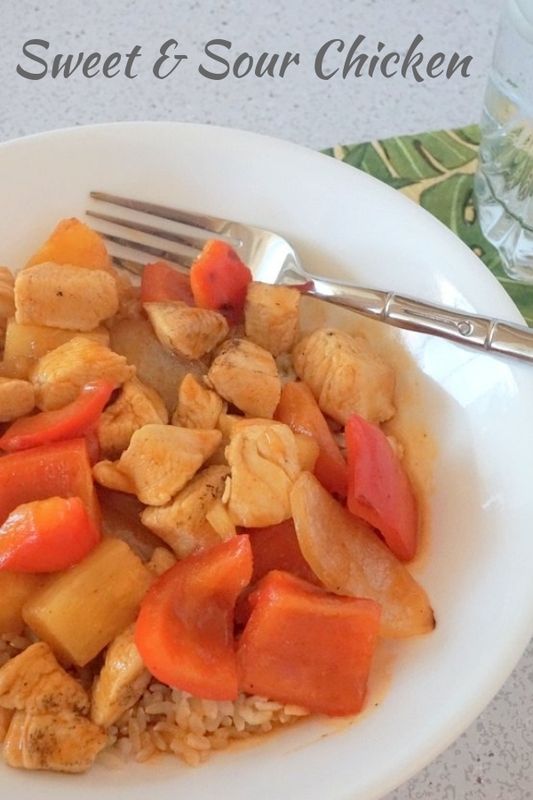 A stir fry is so easy to prepare, there’s really no need for a specific recipe (but I did include one at the bottom of this post)! From beginning to end, this meal is complete and ready to eat in less than 30 minutes! I use kitchen shears to easily cut up the chicken. No need to cut up veggies if you choose to use a bag of frozen peppers and onion, or other vegetable blend. Just make sure your meat is cooked safely and there’s really no way to mess it up! You’re just cooking everything up in a wok or skillet, adding a sauce and simmering! Bonus: Easy Clean-up because you only need one large skillet or wok to prepare this meal! The wok that I love to use for all my stir fry’s can be found on Amazon: Ozeri 12-Inch Green Earth Wok (affiliate link). It cooks food evenly and quickly, is large enough to handle lots of ingredients and is free of toxic chemicals PTFE and PFOA (common in most non-stick cookware). No need for take-out! This healthier version comes together quickly and easily! Heat a wok or large skillet on medium-high, coat with 1 tsp of oil. Add vegetables and cook until slightly tender and caramelized, stirring frequently, about 5-6 minutes. Add another teaspoon of oil to wok and coat pan. Add chicken and cook, stirring occasionally, until cooked through and no longer pink, about 5-6 minutes. 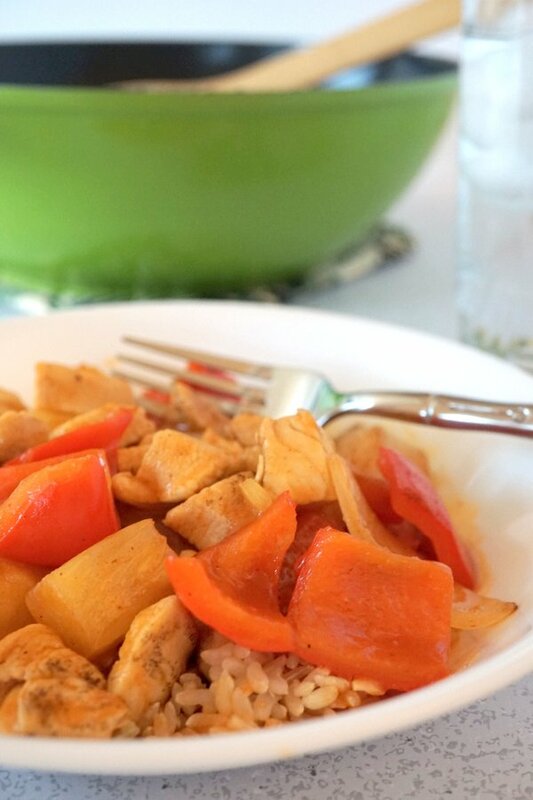 Return vegetables to wok with chicken. Add pineapple and sweet and sour sauce. Stir to combine. Reduce heat to low and simmer for 5 to 10 minutes. Serve chicken mixture on top of rice. 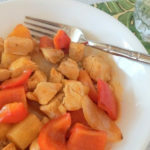 *Replace fresh bell pepper and onion with a frozen bag of pepper and onion or any other stir fry vegetable blend. Thaw and pat dry before adding to wok or skillet. *Variations: Use pork, shrimp or tofu instead of chicken. Switch out the brown rice for jasmine or cauliflower rice.